Who are the members of the armed forces council? Who are those who technically ruling the country in this very critical time “6 months according to their communiqués”? 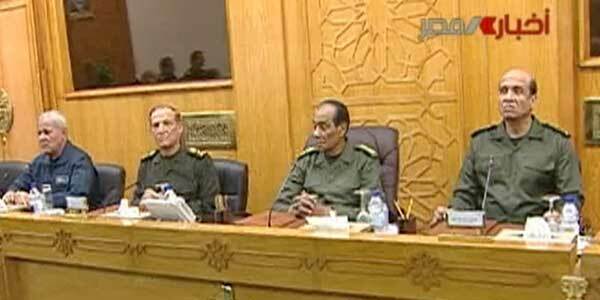 Since the communiqué 1 and that video shot showing the armed forces council which is still in conveying up till this moment official and very few Egyptians knew who these generals are. You must know that during the time of Mubarak the army was isolated from the public in a way you can't imagine. We only remember it in October war anniversary. 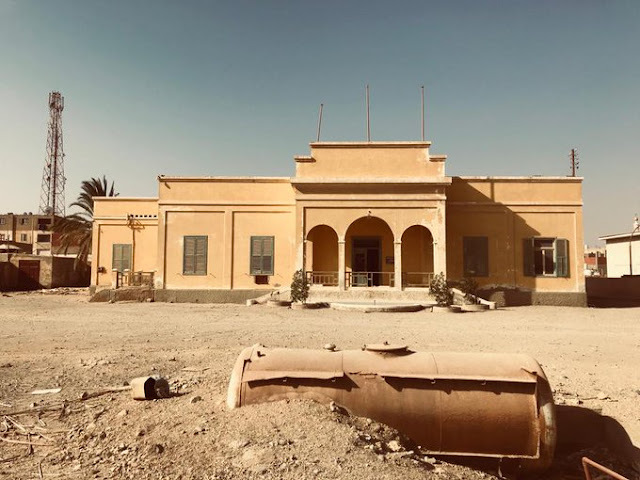 Some say that Mubarak had this complex from the army after the Sadat's assassination while others say that he kept the army away but because he feared coups. What we know from available info to us that the council is made up of 20 members from the minister’s assistants and also the armed forces branches’ heads. This is an attempt to know our armed forces council better. I already gathered info about 10 of them when almost all media was still searching for info and I added the other 10 when their names were announced. What is currently available in the media is based on that short statement from the army. Now I did a little search and here is what I found about armed forces council. The head of the council is 76-years old field marshal Mohamed Hussein Tantawy who served more than any minister of defense “or war” in the history of modern Egypt. He has been our minister of defense since 1991, yes 20 years. Tantawy was the chief of presidential guards “Republican guard” and this may give you a hint why Mubarak trusted him all those years. Another factor we should understand about Mubarak is that he did not keep a minister in this critical ministry or any other ministry if he is popular. Mubarak got rid of Abdel Halim Abu Ghazala due to his popularity inside and outside the army. We used to hear from time to time that he suffered from medical problems. The man is not young already. The recently released Wikileaks cables portray Tantawy in a very negative way, a man that stands against the modernization of the Egyptian army and very loyal to Mubarak. On the other hand, we got some local reports say that Tantawy was not that bad nor corrupted in fact he was the man that stood in front of Ahmed Nazif and NDP gang when they wanted to privatize the El-Salhia reclamation project from a couple of years telling them that they were selling the country. 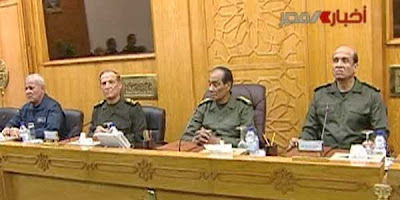 Many people are still skeptical about the armed forces council because of Tantawy's loyalty to Mubarak. I do think that General Tantawy is the actual president de facto, I think the actual president de facto currently is 63 years old General Sami Anan our chief of staff and the second man officially after Tantawy at the council. He is the man whom Major Ahmed Shoman called to save in Egypt in his famous unforgettable moment on Al Jazeera on February 10th, 2011, he is the man whom all the world expects to be the 5th president of Egypt if the armed forces council have other plans for our hot summer. 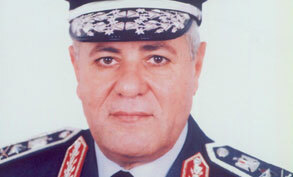 Anan was the commander of the Egyptian air defenses command when Mubarak appointed him as chief of staff in 2005. When the Egyptian revolution started on January 25th, the 1973-war veteran Anan was in a pre-scheduled visit to the United States and this was enough to give people inside and outside a lot to speculate about especially when General Anan cut his visit and returned back home. The news came from the States showed us the U.S administration and the U.S army were giving pieces of advice to the general on what to do in this critical situation. The visit reminded the Egyptians with the visit of Mubarak to the States in 1981 just before the Sadat assassination, it was more like a divine irony for many including me. 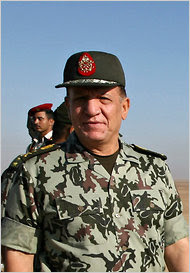 When General Anan came back, many considered him as another army's possible candidate for the presidency who got an American approval just like Omar Soliman. In fact, Anan seemed to be more accepted publicly than Omar Soliman. The reports coming from the States show that the man who was educated in the Soviet Union is also a close friend to the Americans yet at the same time he is considered to be incorruptible by the Muslim Brotherhood, in fact by a considerable number of Egyptians. The critical or rather the star moment of Anan in the revolution when he allegedly refused to use force against protesters as Mubarak and Omar Soliman wanted, if that was true then this man has my respect despite it is actually his role. At the control room "Screencap"
I think if he had declared that he toppled Mubarak and his regime last February 11,2011, he would have got the people's support "look to all those FB groups supporting him as a president"still he did not. 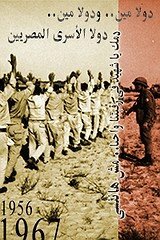 Some sources speak about the army's respect to Mubarak as an old military man but maybe Anan knows that he is not Gamal Abdel Nasser and there are other generals in the army who can stand in his way despite his popularity in the army or maybe it is both reasons or any other reasons. This is why we have the armed forces council and its other members for these 6 months. 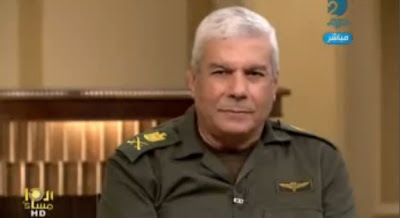 59 years old Air marshal Reda Mahmoud Hafiz, the commander of the Egyptian air forces. Hafez was appointed as the commander of the EAF in 2008 after 3 months of being appointed Air forces chief of staff. 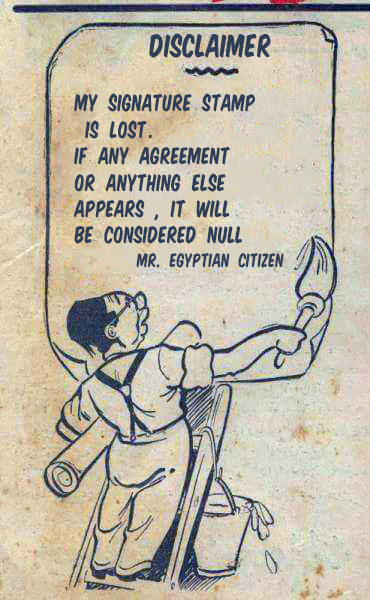 He was graduated from the Egyptian air academy in 1972. He was a liaison officer between Egypt and the States for 3 years starting from 1998. He is married and has got two sons and two daughters. 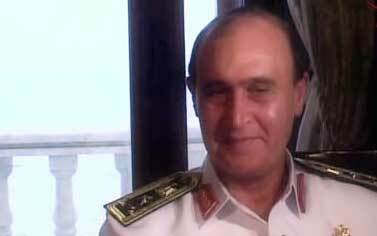 63 years old Vice admiral MohabMamish, the commander of the Egyptian Navy. Mamish was appointed as the commander of the navy in 2007. He was graduated from the Navy school in 1971. He is married and got two daughters. He took courses in the States, France, China, UK and UAE. 62 years old Lt.general Abdel Aziz Seif El-Din, the commander of Egyptian the air defenses command. He joined the War school in 1968 and graduated in 1970, thus he fought in the wars of attrition and 1973. He was appointed as the commander of the EADC in 2005 when general Anan was appointed as chief of staff. He is married and got two daughters. 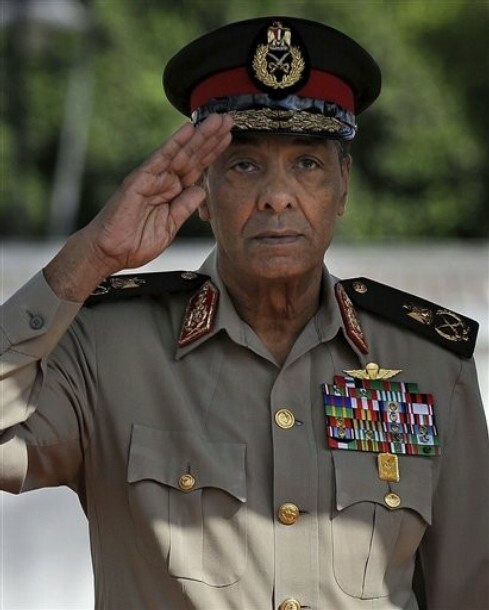 General Mohamed Saber, the Chief of armed forces operation authority. He used to head the 3rd army. 58-years old Major general Hassan El-Rowaini, the commander of the Central military zone which includes Cairo and Giza. General El-Rowaini has become from the familiar faces we know from the army recently as he used to go to the Tahrir square during the revolution to convince the protesters to leave but in vain after the camel battle. I am so concerned about what he said on the video. 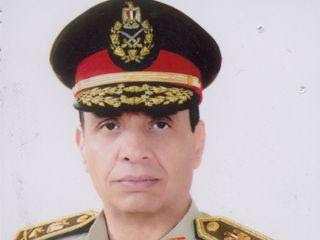 El-Rowaini has been appointed as the commander of the central military zone since 2008. Major General Sobhi Sedky, the commander of the 3rd army. General Sadky has been the commander of the 3rd army since August 2009. The 3rd army covers Ismailia to Suez. The 3rd army is doing a huge job in Suez city, already Sedky is currently representing the military ruler of the governorate as the governor escaped and left the governorate as far as I know. Suez was our true Sidi Bou Zid. The relation between the army and Suez is very special considering the history of the great city in war. 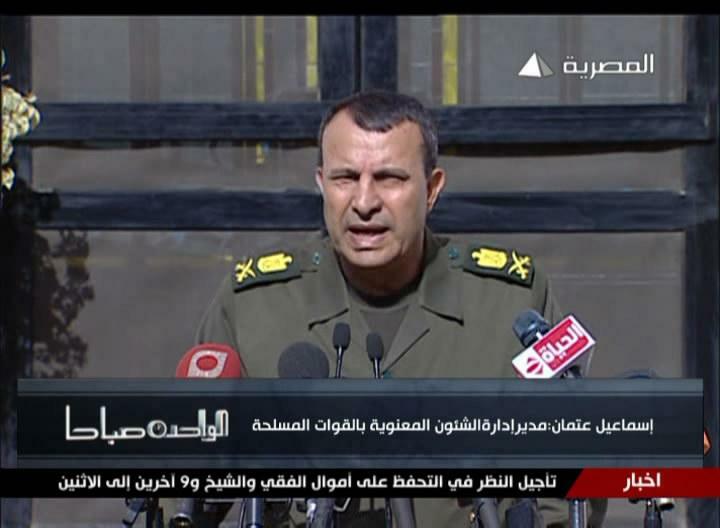 Major General Mohsen El-Shazly, the commander of the South military Zone. The South military Zone covers the South of Egypt starting from Upper Egypt till our borders with Sudan. 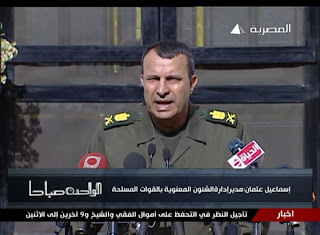 Major General Mahmoud Hegazy, the commander of the West military Zone. The military zone covers the West of Egypt till our borders with Libya. Major General Mohamed Abdel Nabi, the commanders of the Borders guards. Major General Mohamed El-Attar, the assistant minister of defense. No further info available about him. And of course there are five generals we already know from TV, they are like the stars now. 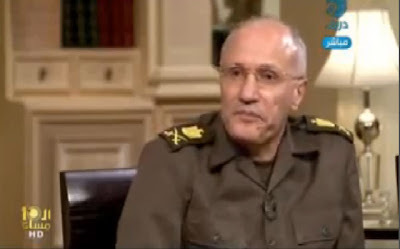 General Mohsen El-Fangary, assistant minister of defense who gained more popularity and also trust more than Etman. El-Fangary is the one who read the army's official communiques in his distinguished voice. He entered history by reading the 1st communique. 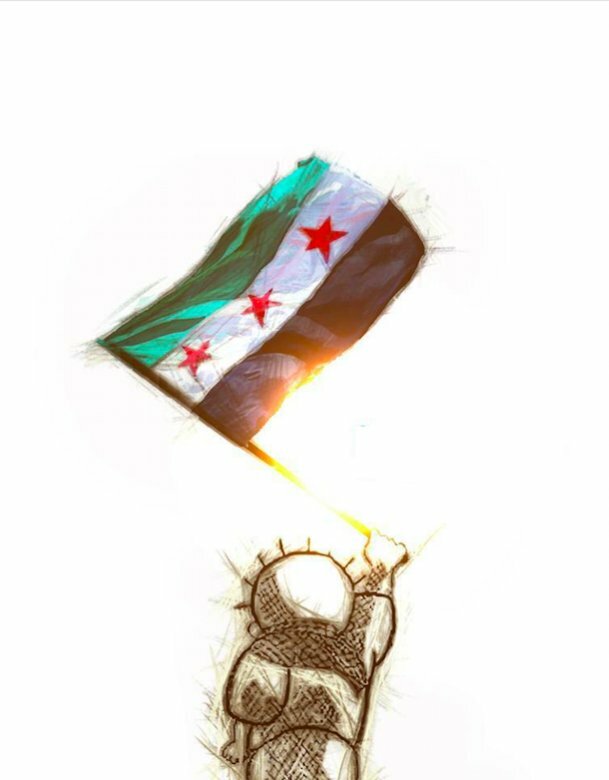 He became a star when he read the third communique on February 11,2011 and saluted our revolution's martyrs in that iconic shot. He has got now fan Facebook pages like this and that. I do not have info about him except that he used to head the organizing and mobilization apparatus in the Egyptian army. People began to miss this man by the way. 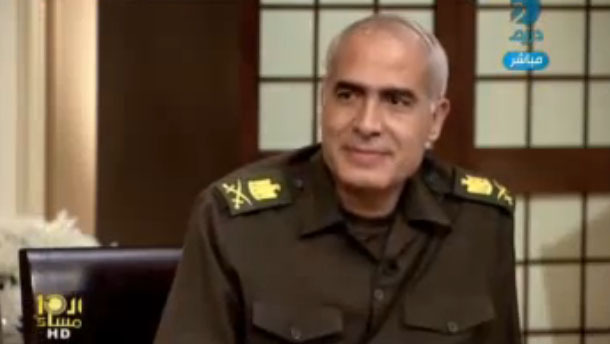 General Mokhtar Al Mollah, the assistant to the minister was introduced to Egypt last week on TV on 10 PM. General Al Mollah used to head the War school till 2009. He is known to the media from that time and I think that gave him the experience to speak with the public. Again he is a paratrooper from the insignia on his suit. I think he used to be our military attache to Moscow for a while. General Mamdouh Shahin, the assistant minister of defense for legal and constitutional affairs who was introduced to the Egyptians last week in 10 PM show. There is not much information about him but the man seemed to have a great legal and constitutional experience and thus I assume he originally was a lawyer or studied at the law school before joining the war school. The man seems to understand constitution and law better than Fathi Sorror !! According to what I notice from what these delegations of youth say only 3 or 2 generals meet them each time. These are the members of the council and what I could have found from information about them. I hope that the generals think in a more open way when it comes to the media because honestly, this is not a war, it is even scarier for us and for them. We know that this is not their role and we respect the huge responsibility and challenge they are facing but they must understand we are seriously in a historical moment. This army council can mend what the 1952 revolution council had done and will be forever remembered positively in our history, they are older, wiser and more experienced than the free officers for sure. If you have more information please do not hesitate to share with me and the readers. This is great work you're doing. I read your blog just about every day. thank u very much for the effort, it really is very useful. Gives a good perspective of your country and how it is govern with these generals having each area of Egypt to guard. Amazing that it just now coming to light. @Dr.Ramy , thank you so much ,I think we need it to understand who we are dealing with. Thank you very much for your fascinating work about Egyptian Youth and Workers Revolution. I'll wait each day to read you ! Have you info about meetings and strikes in Mahallah and in others towns of the country ?